ATLANTA, GA –June, 5th 2018 – CATMEDIA host Linda McMahon on her Ignite Tour visit. Linda McMahon, who serves as the 25th Administrator of the U.S. Small Business Administration (SBA) and who is just one of five woman in President Trump’s 22 person Cabinet, is visiting CATMEDIA’s Atlanta headquarters during her SBA Ignite Tour to meet with Catherine Downey, 2016 Georgia Small Business Person of the Year, to discuss her personal SBA success story. Catherine Downey is the founder and CEO of CATMEDIA, a full service communications company headquartered in Tucker, Georgia. For the past five years, Georgia has been ranked #1 for business success due to small business, giving the leader of the Small Business Administration even more of a reason to pay the state a visit. A highly successful entrepreneur and reputable business executive herself, Linda McMahon is currently on tour visiting small businesses across the country, spreading awareness of the agency’s programs and services and getting real-time input on today’s most pressing challenges. It came as no surprise that CATMEDIA made the tour, as it’s been named one of the top 100 fastest growing companies [top five women owned businesses] in America by Inc. Magazine. 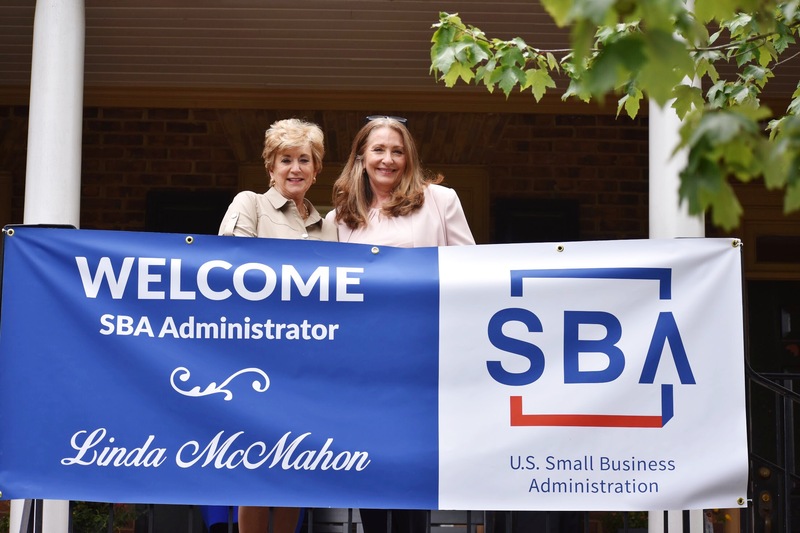 CEO, Catherine Downey, lead the SBA Administrator, along with her entourage, on a tour of her vibrant 3 story office building to meet with each of her employees, a 5,750 square foot facility that was purchased through the SBA 504 loan program. Downey, a single mom, started the firm using her experience in television production and media and project management and built a thriving business while also caring for her young family. Her years of hard work and sacrifice paid off, and with grown children now, Downey has redoubled her efforts to expand her firm to meet the ever-changing needs of federal and commercial clients in today’s fast-paced world. In 2011, Downey changed the company name to CATMEDIA to reflect its expanding services. The CATMEDIA CEO credits SBA and its partner organizations for helping her successfully scale up her firm and her own executive management skills. “I feel like a poster child for the SBA as I have participated in many federal government programs and services that have helped grow my business.” Either she or a team member visits the SBA on a quarterly basis to remain engaged and plugged into the vast network of resources. “Each class or meeting has been a building block for my growth and the growth of the company”, said Downey. During the meeting Downey was also quoted saying, “ They have an enormous amount of resources to help you. I mean I would not be in business today if it weren’t for the SBA”. Through SCORE, Catherine learned about federal procurement which lead to her certification in SBA’s 8(a) Business Development Program. She is a client of the Georgia Small Business Development Center and a graduate of the SBDC’s Fast Track program. She graduated from SBA’s Emerging Leaders Program as its 2014 class valedictorian. McMahon has been a longtime advocate for women in leadership and business and has been widely recognized as one of the country’s top female executives. As the co-founder and former chief executive officer of WWE, based in Stamford, Connecticut. She helped grow WWE from a 13-person regional operation to a publicly traded global enterprise with more than 800 employees in offices worldwide. She stepped down as CEO of WWE in 2009 to run for the U.S. Senate and was the Republican nominee to represent the people of Connecticut in 2010 and 2012. CATMEDIA has been recognized as a leader among government services contractors. Fully staffed with true innovators, the firm is patent-pending on several training and communications technologies. Additionally, CATMEDIA has twice been named to the Inc. 500 list of the fastest-growing private companies in America, and made it in to the Top Ten of the Atlanta Business Chronicle’s 2015 Pacesetter Awards for Atlanta’s 100 fastest-growing private companies.